Crews move the primary payload for space shuttle Endeavour's STS-134 mission into the Payload Changeout Room on Launch Pad 39A at NASA's Kennedy Space Center in Florida. CAPE CANAVERAL, Fla. -- By a fluke of scheduling, NASA plans to launch the space shuttle Endeavour on its final mission the same day as the much-anticipated royal wedding in England. 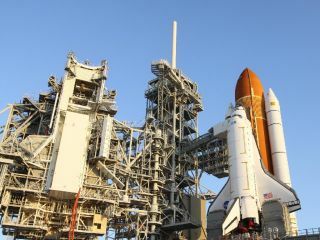 Endeavour is slated to lift off Friday (April 29) at 3:47 p.m. EDT (1947 GMT) from NASA's Kennedy Space Center here. Earlier that day, Prince William of Wales, second in line for the British throne, is to wed Kate Middleton at a lavish state wedding at Westminster Abbey. Asked by a reporter if mission managers considered the wedding when setting the date for Endeavour's STS-134 launch, NASA's associate administrator for space operations, Bill Gerstenmaier, said: "The frank answer is no." "I didn't realize when the wedding was until we moved the launch date," Gerstenmaier said. "We set that date independently, and then as I was setting the date somebody called me and told me about the wedding." The launch date was chosen in consideration of what's called a beta-angle constraint, which limits the times the space shuttle can visit the space station based on sun angles to the station's solar arrays. Mission managers also weighed the schedule of the other rockets that must lift off from the same launch range. "We work beta constraints and we work launch-range constraints. I haven't yet put on our manifest charts 'wedding constraints,'" Gerstenmaier said. "So we didn't factor that into our thinking." While the wedding will certainly be high-profile, NASA hopes to attract media attention to the launch as well, which should receive a boost now that President Barack Obama has announced he and his family will watch in person from Cape Canaveral. Arizona congresswoman Gabrielle Giffords, recovering from a head wound in an assassination attempt earlier this year, also plans to attend the shuttle launch. Her husband, Mark Kelly, is commander of the Endeavour mission. The royal wedding is "a very, very media-heavy event, so certainly it's going to be time-shared with any coverage we might get, but I hope everybody's interested in these last few flights and that we do get some coverage," space shuttle lead flight director Gary Horlacher told SPACE.com. After Endeavour's 14-day trip to the International Space Station, NASA plans only one more shuttle mission. Atlantis is slated to lift off June 28 on the final launch of the 30-year-old space shuttle program. After that, NASA will send its three shuttles to museums for public display. For Endeavour, that will mean retirement in Los Angeles at the California Science Center.